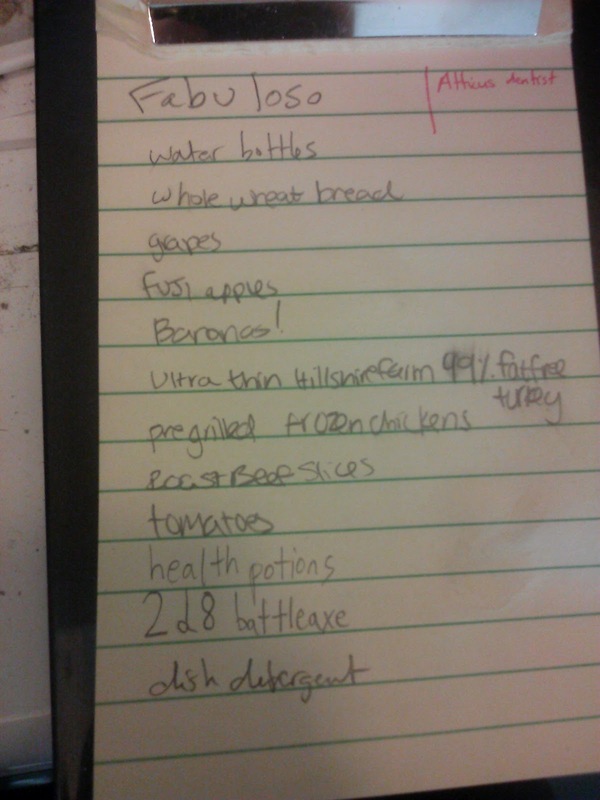 I keep a shopping list on the side of the refrigerator, and family members write down what they need me to get from the store on the next shopping trip. Check out the last couple of entries (except the dish detergent -- I wrote that before reading any of the rest of the list). Welcome to all of you who discovered this blog via the Reaper Miniatures Kickstarter! I know that there are a lot of questions about Swords & Wizardry and how exactly it interfaces with Reaper. It doesn't actually have anything to do with the fact that we are all Texans, because Texas (as we keep reminding y'all) is a big place. It takes me about five hours of driving at breakneck speed to reach Denton. A bit more about the Reaper-Frog God-Swords&Wizardry connection in a later post, most likely, because many of the new visitors are wondering what this whole Swords & Wizardry thing even is. Other than the quick answer that it's the rules (re-written) of the original 1974 fantasy roleplaying game (the Complete Rulebook includes rules from the supplements as well) -- the answer gets a bit more complicated. Swords & Wizardry doesn't exist in isolation. It's part of a very large "movement" or "trend" or whatever you want to call it, toward playing either the out-of-print versions of D&D or playing a retro-clone of some of those rules. Most of us have seen the edition numbers out there, mentioned on the internet: 0e, 1e, 2e, and then 3e and 4e. Swords & Wizardry is a clone of 0e. There are a number of blogs, forums, and web sites devoted to various aspects of this whole thing -- many of them are linked over on the right side (these are the ones with more of a Swords & Wizardry emphasis). Just to single out one link you can follow to see a glimpse of the Swords & Wizardry community, here is a link to Michael Cote's recently-begun blog, devoted to monsters. Michael has done a lot of art for S&W projects, and his write-ups are compatible with Swords & Wizardry. More links and ideas will follow as we continue toward the completion of the Kickstarter! Reaper miniatures has just added a free copy of the Swords & Wizardry Complete Rulebook pdf as part of the $2,840,000 stretch goal. If that goal is hit, it means something like 10,000 people will get copies of the rules. Incidentally, if you haven't looked at the Reaper kickstarter, it's pretty unbelievable what you get for $100 at this point. 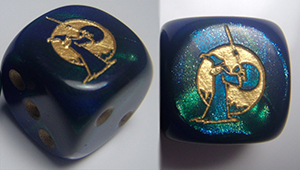 A picture of the Swords & Wizardry dice that come with the Kickstarter. These are pretty cool, and they show the new logo of the wizard with sword. The result of the recent WotC good-bombshell is going to be far-reaching. Anyone who doesn't know what I mean by the bombshell, it's the announcement that all of the TSR catalog will eventually be released in electronic format. While there are a couple of questions about this (what's meant by electronic format being the main one), it is a dramatic return to an earlier, more open approach in terms of keeping WotC intellectual property available for people to use, rather than keeping it squirreled away. There's no question that this is a great boon to old school gamers, no matter what mistakes they make in terms of format, timing, or other details of the roll-out itself. I have already had a couple of people contact me with the question about whether I think this will cause the decline, or even the fall, of the retro-clones. I think it will ultimately cause a massive change to the way retro-clones interact with the gaming community, and I think it's a change that some people will, indeed, see as a decline. I also think the result will be that more people actually put copies of some retro-clone onto the gaming table and use it in actual play. In other words I think there is going to be a quantitative increase, but there will also be a qualitative change that many people will see as negative. Here is what I think is going to happen, and where we are right now. The retro-clones are about to disappear, each into a community that also includes the pdfs of the original games, and for the first time we are going to see a relatively tolerant relationship develop between those who are playing with the original rulebooks and those who are playing using the retro-clone versions. This sounds very Pollyanna-ish, especially since the same situation (legal pdfs, legal retro-clones) has existed in the past without any real joining-up of the original-vs-clone players of the same game. Why would the fact that this is WotC bringing us back to an earlier structure of what's available have any different result from the last time we were there? 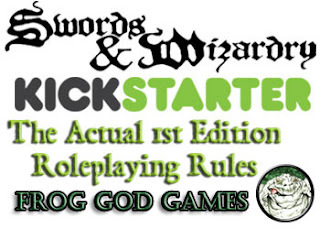 In particular this changes the role of the Swords & Wizardry Kickstarter midstream. All of a sudden what's happening is more (or less) than the marketing of a rulebook and monster book. It's about building a community that can use both S&W and OD&D now that both are available. If I'd know about this in advance, the Kickstarter would probably have been organized in a different fashion (although I don't know what that would have been, off the top of my head). As it is, I think it works well -- by accident I beat myself to the punch in terms of having a re-boot of Swords & Wizardry going right at the moment that WotC did this. On the downside, it means that there is some real thinking to be done about the role of Swords & Wizardry -- and that thinking has to be done in realtime, on the fly. Jeff Dee art; your ideas? On the Swords & Wizardry Kickstarter, we just hit the bonus goal at which we're going to send a "Dungeon-Making Kit" of pencil and graph paper pad along with the books -- the graph paper is going to have a spot illustration by Jeff Dee on it. My initial assumption for the topic of this illustration (small, in corner of page) was that it would be a compass rose, but I realized that the internet as a whole might come up with a cooler idea for what ought to be on a sheet of mapping paper. The Kickstarter rules don't allow a Kickstarter project to raise money for a charity. We've had a couple of back-and-forth discussions with them about the difference between a charity and a non-profit, etc., etc., so we are making a minor alteration to the way that we donate to the Gygax Memorial based on sales of Swords & Wizardry Rulebooks and Monster Books. We won't know, immediately following the Kickstarter, how much the additional sales will drive the donation higher during the rest of the year, and we also don't know the timing on the Memorial's needs, but if needed we will contribute the "raised so far" amount earlier, and then tally again at the end of the year. We're talking to Gail about it, and we'll get those details worked out. I'm sure Kickstarter has a good reason for their requirement, and having a Kickstarter even as part of the process will almost certainly lead to a larger dollar amount being donated than we could have done with internally-generated sales. So, I can't really complain. One thing I just realized will be a question -- yes, those are retroactive numbers, so if we sell 6001 books, the total donation would be $15,002.50, with $2.50 being donated for each of the whole set. First D&D thing you bought with money you earned? I was just thinking back to Dragon Magazine #39. I think that it's my favorite issue of Dragon, objectively, but it also happens to be the first D&D purchase I made with money I earned from mowing lawns (as opposed to an allowance for doing chores). 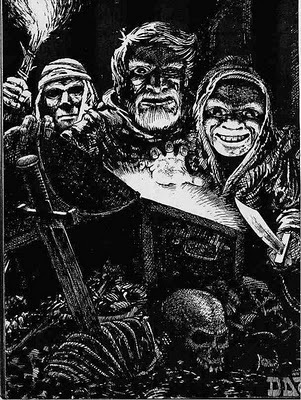 What was the first D&D item you bought with earned money (other than allowances)? Do you think that it affected your perception of its quality? Tougher Books and More Monsters, YES!